The title of this post is QuantumListing: One Year Later, but that's not quite right, since we started the development over half a year before we launched. One year later refers to the date that the QuantumListing app became available on the iTunes App Store. We were mobile-first, and that is an important part of our governing philosophy: make a commercial real estate listing product that is easy to use, especially from a mobile device. 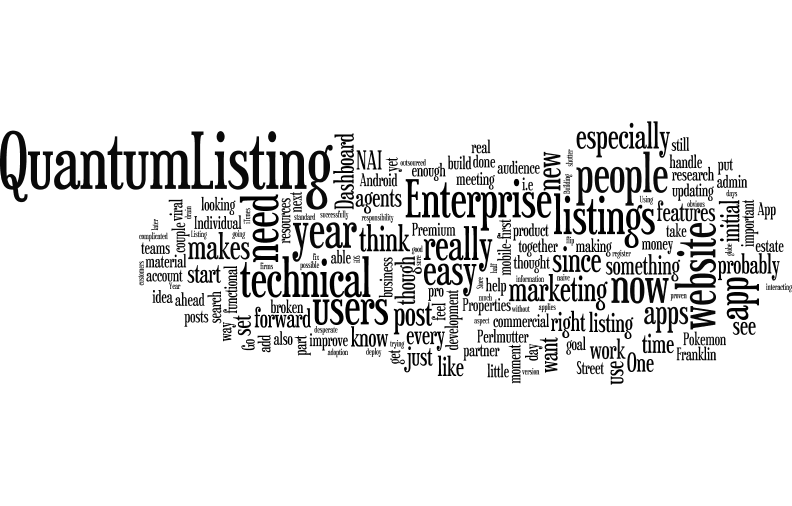 One of our first blog posts, QuantumListing, the Crowdsourced Listing App, Is Now Available #CREtech, was published on August 6, 2015. It really encapsulates what we are trying to do, "Our goal is to provide the information people really need, where they need it, at an extremely cost effective price." The next couple of posts in the QuantumListing Blog are about some of the challenges of being a start up, i.e., technical glitches, how to build an audience, and why users should try a crowdsourced app that doesn't have a crowd yet. As frustrating as it is to me, and probably the users, too, you just have to plow your way through the technical issues, hopefully identifying them and fixing them in a timely manner. Using outsourced development teams makes it a little more complicated, because you can't just walk over to someone's desk and ask them to fix it. Building an audience is something I work on every single day. We haven't had our Pokemon Go viral moment. As I said last September in my post, 4 Way Street "It's not enough to simply let people know that QuantumListing exists. "If you build it, they will come" may work in the movies, but I'm not naive enough to think that applies to a new product, especially one that requires some effort from the user. Getting people to download it, register, and add their listings when they have other ingrained habits won't be easy, even though we've made the process as simple as we can. I look forward to the journey ahead, and hope that there will be more days of triumph than frustration. With your help, I think it can be done." Man, was I right. With the experience I have now, that Pokemon Go viral moment would probably be a disaster, since I now know that I would need a larger team to handle that kind of influx. Although, maybe not, since, new users sign up and add listings all by themselves, and at an accelerating pace. Believe me, I'm looking forward to the day I have to upgrade our server! What are the greatest differences between my initial expectations and where we are now? I thought that more brokers and brokerage firms work the way I do. At Perlmutter Properties, I still think of my self as a jack of all trades, although truth be told, I do outsource my bookkeeping and website and marketing material design. It has been a long time since I've had an admin though, and when I need to put together a letter of intent, do research, or send out marketing material to a broker or tenant, I'm the guy that does it. Bigger companies have people for many of those tasks. I probably should have done more research on that earlier on, but I did not. So, I thought that there would be more adoption of QuantumListing sooner. And, I still think that mobile-first will be a key to our future success as native phone users become a more important part of the commercial real estate industry. For the present, though, we're concentrating on making the QuantumListing website fully functional, yet having it conform to the principles we set out to embody in our app, i.e., easy to use, full of social friendly features, and affordable for anyone. Additionally, our discussions with marketing directors have led to the recent introduction of our Enterprise Dashboard. The marketing director or admin can use the Enterprise Dashboard to add all of the company's agents and listings, and assign multiple agents to a listing. The Dashboard also makes it very easy to edit and delete listings as the properties get leased or sold. We have two NAI affiliates, Piscataway, NJ based NAI DiLeo-Bram and Lexington, KY's NAI Isaac for which we've helped set up Enterprise accounts. They have been successfully updating their listings on their own. Last week, the Fort Lauderdale office of Franklin Street Advisors set up their own Enterprise account, adding their agents and several listings by themselves. We are happy to help "on-board" new Individual and Enterprise users, but Franklin Street's self-starting their own account was especially gratifying, and it makes me feel that we are really on to something. Looking forward to a year from now, what would I like to see? Satisfied customers, and lots of them. How will I know that we achieved customer satisfaction? We've given our new users a year's free trial Premium Membership (Premium members can post listings, all users can search every listing without a paywall). I would like to see an increase in Individual and Enterprise Members. I want to continue to improve the website. I would like to update the iOS app and have an Android version that is more functional. Right now, the website has more features than the apps (especially the Android app, which has been a live Beta, not really meeting my standard). Since the apps have not been updated, the website and apps don't always play well together. An alternative to updating the apps is deprecating, then eliminating them, and making sure that the responsive features of the website are at a level that makes that possible. So far, QuantumListing has been self-financed. There have been pros and cons to this, some of which are flip sides of the same coin. The obvious con is that it is a drain on my own financial resources. The pro of this is that I take fiduciary responsibility very seriously, and I'll feel much more comfortable asking for other people's money knowing that I've already put my own money where my mouth is, and that the concept has been proven. Another pro, is that, by having a year of operation, I've gotten a better idea of where my initial thinking has been right, wrong, and also, maybe just a little ahead of its time. From the beginning of my start up, I've broken a couple of the rules. Conventional wisdom says you need to quit your job. I enjoy Perlmutter Properties, and it is a successful business with a 27 year history. I really don't want to shutter that. The other rule I've broken is that you have to have a technical partner. I can see how that would be beneficial and admit it would expedite progress, in today's world of easy access to technical teams around the globe I've been able to get by. I'm leaving the door open to take on a technical partner, but it's not something for which I'm desperate or actively in search of. Yet. Although I can't handle any of the technical side of the business, being self-funded has caused me to understand almost every other aspect of it, since I've had to do it. So, when I do hire people (other than student interns and freelancers), I'll have a pretty good idea of what I'm looking for and what they need to be able to do. In the meantime, it's early mornings, late nights, and stolen moments during the day. It is both energizing and exhausting. I love learning knew things and meeting new people, and that helps keep me going, along with the support of my family. Ideally, in the next twelve months I'll have raised an initial seed round of capital. The goal is to further improve QuantumListing and accelerate growth. I've spent time reading about and interacting with other start ups, and have a decent sense of where I would want to deploy resources. I'm looking forward to writing the follow up to this post a year from now!